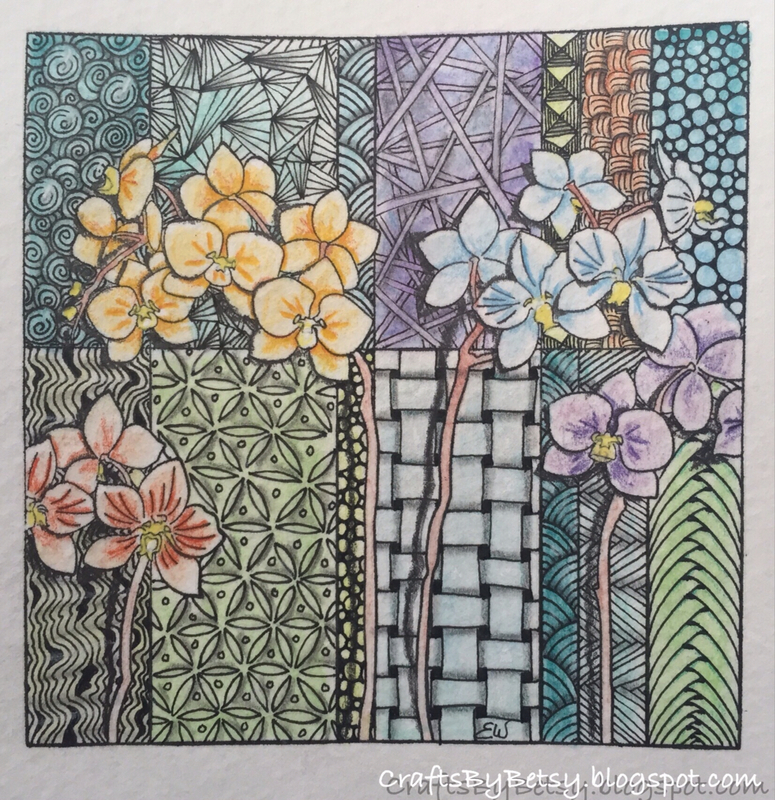 This Zentangle® Inspired Art (ZIA) is my contribution to The Diva's Challenge # 222 Colours of the Rainbow! 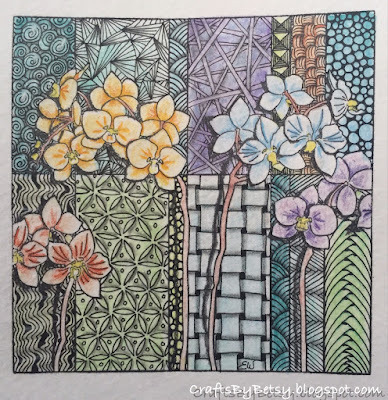 First I used a rubber stamp "#90391 Orchids" by Stamps Happen Inc, Cathy Squire Image Source, inking with Onyx Black Tsukineko VersaFine pigment ink onto a watercolor scrap that was 6 inches square. The stamp is approximately 4 inches square. Here is the image (the black outlines) after I added some watercolor pencil with my CretaColor Aqua Monolith pencils. Next I added water with a watercolor brush to each section. After it dried, I tangled with an 005 Sakura Pigma Micron in black. 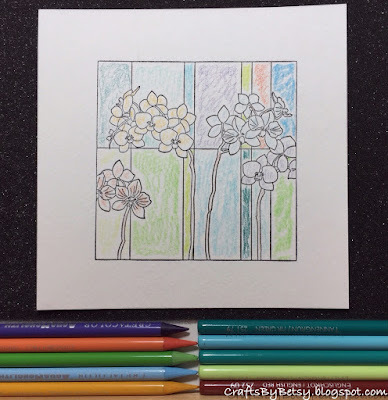 I added shading with graphite (I'm loving my CretaColor woodless pencils, they are so creamy smooth) and a touch more color with the watercolor pencils, but left them dry this time. I'm quite happy with my subtle rainbow. Tangles are Shattuck, Betweed, W2, Quandary, Printemps, Avreal, Hibred, Diva Dance, Tipple, Keeko, Hollibaugh and Munchin. This is gorgeous. The stamp is very pretty and you've really used some imagination to get the right patterns in the background. This is a fabulous tile! It is really nice seeing the in process and final views. Hello from a fellow CZT 14. Your work is beautiful. Thanks for sharing the materials and process. Love this piece. The stamp you chose was perfect for adding color, IMHO. I especially like your first tile. The background seems like an exotic wallpaper behind some flowers in a Victorian parlor-----or I have a very vivid imagination. ;-) Very nice! Such pretty soft colors! Thank you for sharing your process. We all learn something new! Love those woodless pencils! I have a regular graphite one but didn't know they came in color! Beautiful! Very beautiful, and thanks for sharing the process! How pretty! and you're so precise with your patterns! It is so pretty and so delicate... Very nice job! Absolutely gorgeous ZIA with wonderful muted colours! I seriously love this ZIA. 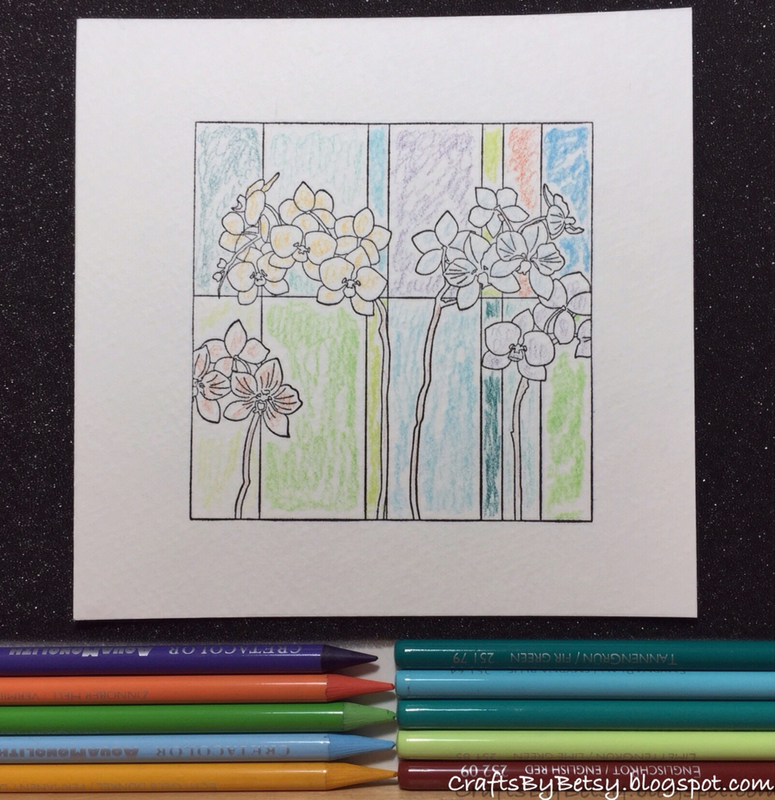 The colors are so subtle but really work together and the shading makes the orchids pop so nicely! I love both the idea and the execution. Its a beautiful piece of art.